Aspiran took the European Weekend of Heritage (patrimoine) seriously this year and included in the events and exhibitions was a display covering wine. Specifically highlighted were the Aspiran producers who now number 10, along with the cave cooperative (Clochers & Terroirs). The longest established are Domaine de Fabrègues (1835) and Chateau Malautié (1900). Domaine des Montèzes arrived in 1995 having been displaced by the building of the A75 autoroute above Lodeve. 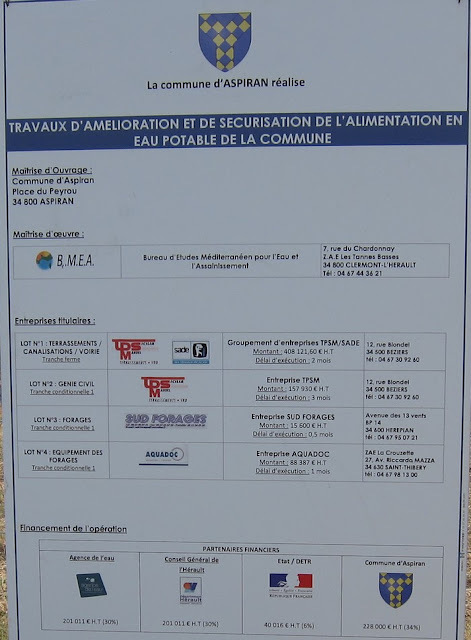 The grapes around their Aspiran property apparently go to the cooperative with wine being made on site from grapes brought down from their Pégairolles de l’Escalette vineyards. It was after 2000 that new arrivals took root, possibly fuelled by the decline of the cooperative before relatively recently joining the Clochers & Terroirs clan of cooperatives. Domaines Mon Mourel, Ribiera, Clos Mathelisse, Villa Symposia, des dimanches and most recently Gregory White and Mas Troqué complete the list. 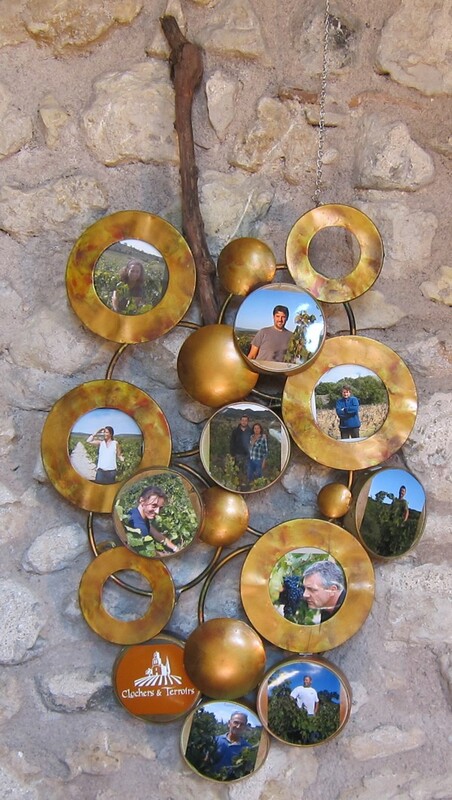 Interestingly several producers in nearby villages have vineyards in the commune, ones I know about being Mas Costefere (Adissan), Julien Peyras (Paulhan) and Domaine les Quatre Amours (Bélarga). Wine from almost all the producers can be purchased from the Aspiran Tabac which is by the village crossroads. 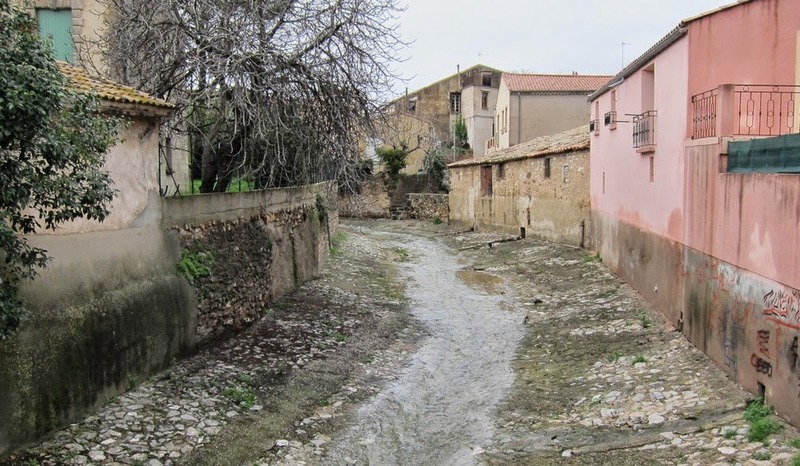 According to the Midi Libre in 2014 Aspiran had tap water pesticide levels at least 25% above the norm, a worrying phenomenon that impacts 33,500 inhabitants from 9 communes of the Hérault. In the summer of 2014 what was effectively a hose pipe ban was inroduced for Aspiran after several years of below average rainfall. 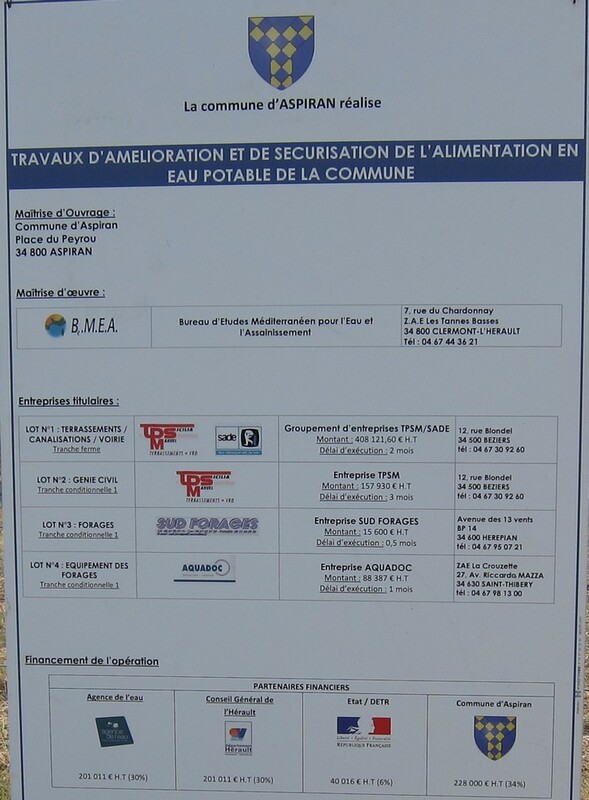 Responsibility for providing tap water falls with the Mairie. 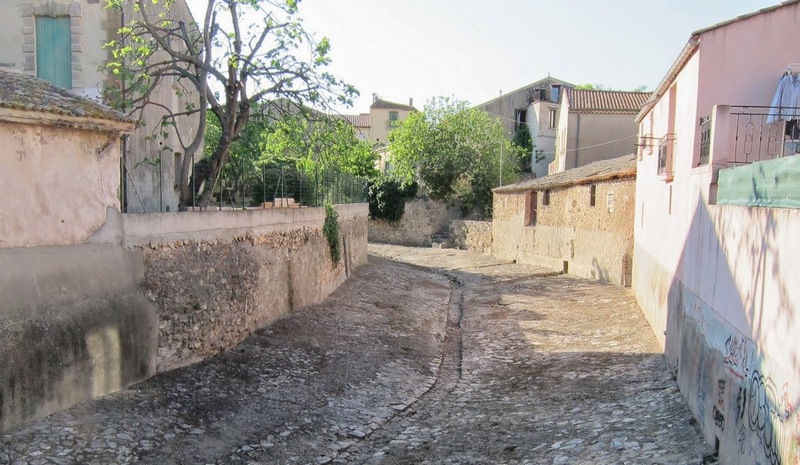 A couple of years ago a new source of good quality was identified in the area called la Plaine very close to the Hérault river opposite the village of Tressan. Only at the end of 2014 was a tender issued to exploit the source. This summer work is in progress to build the well and lay a pipeline some 2 Km long up to the village from where it can be processed and pumped to the water tower atop of Les Pins. 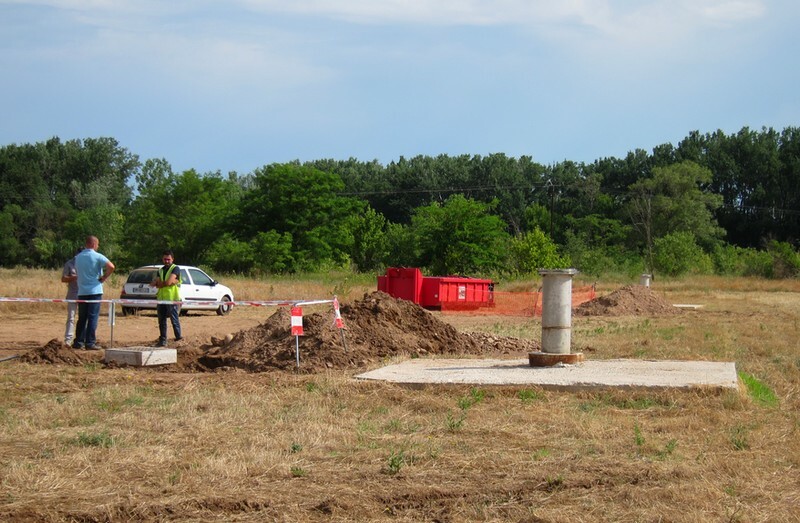 Total cost is around 670,000 € and planned to be on tap by the end of the year. 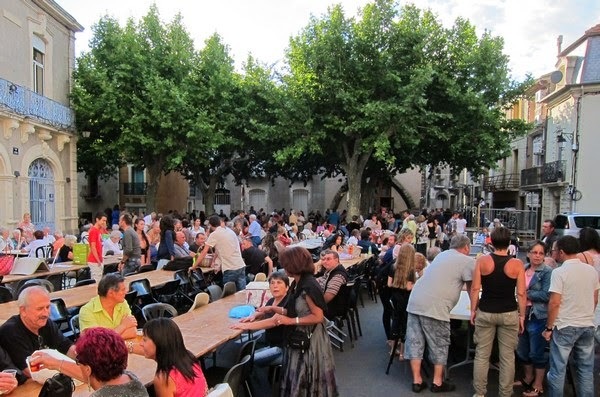 The annual village eve of Bastille Day meal saw changes this year. First of all it was moved to the 12th July from the 13th to avoid conflict with the World Cup football final. It also moved back to the Place du Peyrou after 2 years on the Pétanque pitch. A live group was replaced by a disc jockey, not a bad move considering half decent musicians will have been in big demand. As compensation there was a a live spectacle of dancing can-can style to get everyone into the mood. Another change was the return after many years of the BBQ by the church wall. Having cooked some excellent sausages the shot below captures lamb chops for 750. 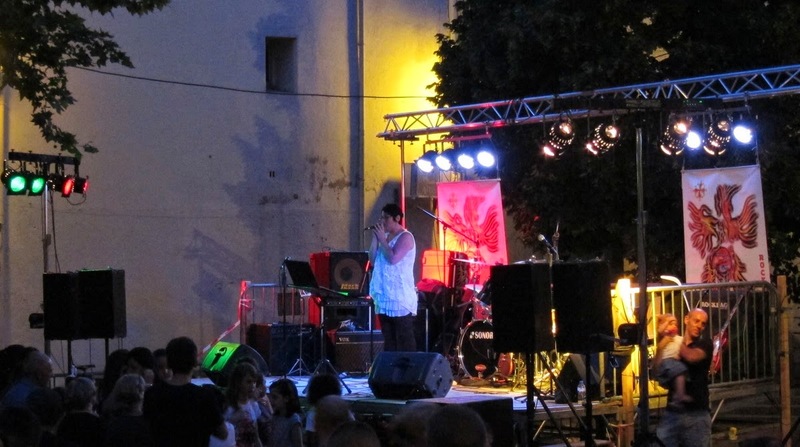 In France, the Fête de la Musique has been going since 1982 when it was initiated by the culture ministry. The idea is for musicians across the spectrum perform for free on the longest day of they year (and well into the following day). 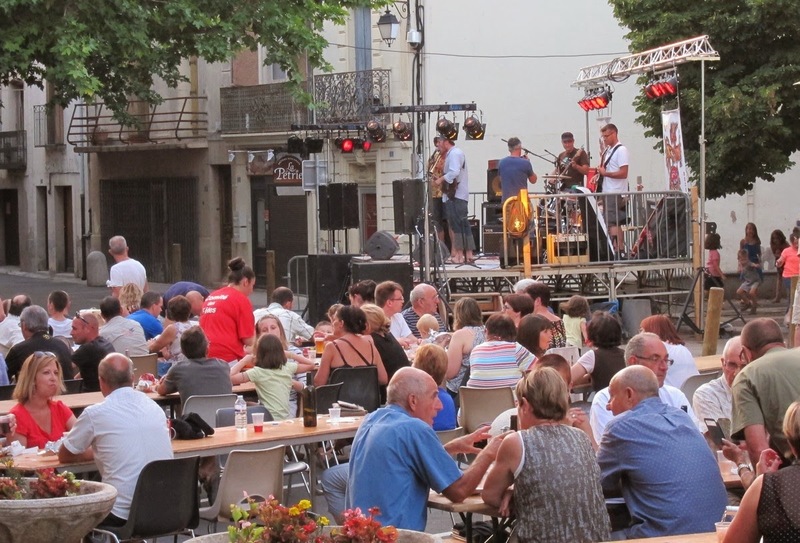 Most towns and villages erect a stage and provide a buvette for 7+ hours of live concerts. 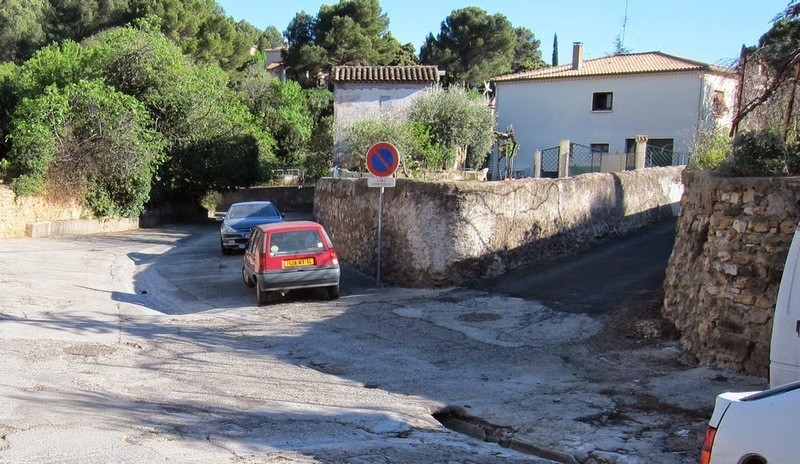 The village has never seriously participated beyond the independent efforts of the Café de la poste. 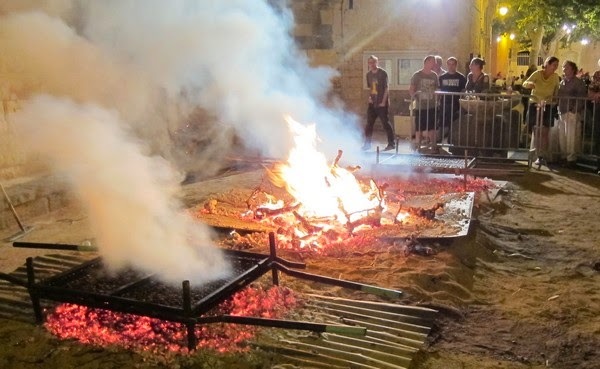 This year saw the first Mairie organised event, at least this century. A new Mayor was elected this spring so plaudits and complaints go to the Mairie. Given the big turnout the evening was a resounding success. No doubt a balmy evening and the 21st June being a Saturday this year helped. The Café de la Poste takes it's name from the former post office next door, the stonework engravings are well preserved. Founded in 1903 it has outlived three other village cafés during that time. Spring 2013 saw the arrival of a new owner Alain. Before then it was more functional as a café and bar with a somewhat basic restaurant. Arguably somewhere to go out of necessity than pleasure, rustic would have been a polite description of the wine for example. One year on and while little has changed physically beyond some improved lighting and a splash of paint, the atmosphere and events have been transformed. 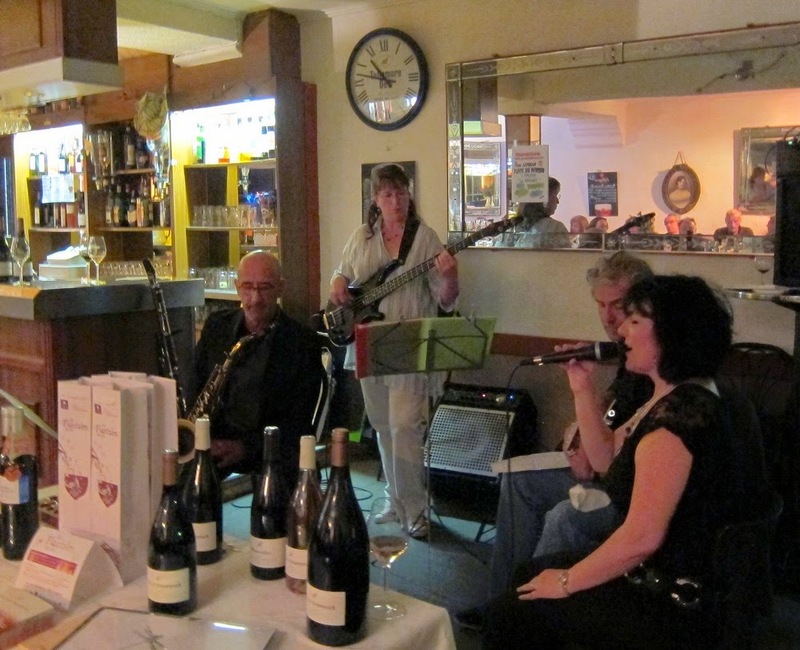 Wednesday night is (loosely) Jazz and Blues with an open stage to all comers. Thursday is Karaoke. Most Saturday nights feature a band. The scene below is from an Easter dinner with music and wines to partner the meal including village producer Villa Symposia (wines also available in the bar). Facebook users can keep up to date at Café de la poste. The Garelle frequently all but dries up in summer and in the many dry winters of recent years has been barely a trickle. 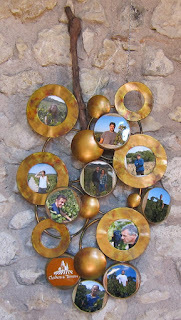 So far 2014 has been worryingly dry and as the photos above show so is the Garelle. Even the pools and damp moss patches have gone. The UK has witnessed the wettest winter on record in places. 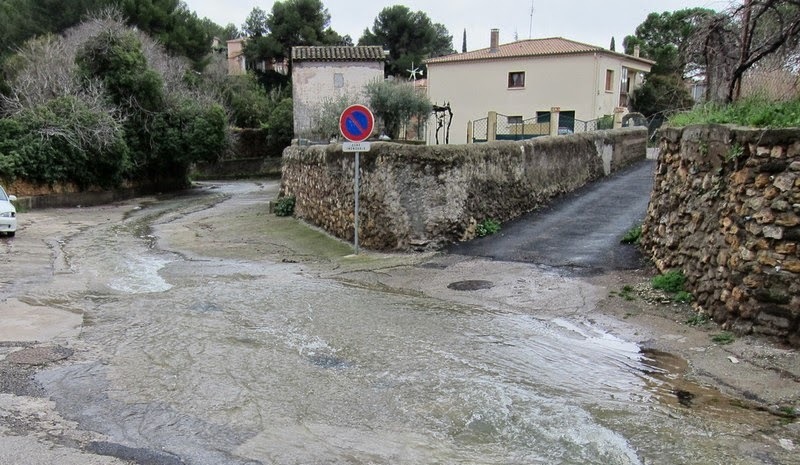 By contrast March 2013 was the wettest here since perhaps 1946; it was in Montpellier with 215 mm and north of Montpellier around the Pic St Loup 2013 had the wettest March on record. These pictures from the same spots were taken after these rains. 2013 also saw late spring rains. As well as losing all the almond crop in March several varieties of apricots were lost in April and May to flowering inhibiting deluges. At the time of typing there is little rain in the forecast. Tabacs in France are institutions and survive reasonably well thanks to the law where prices are fixed and licences to sell tobacco products are based on local population figures. Supermarkets can't sell tobacco although a Tabac is often attached. 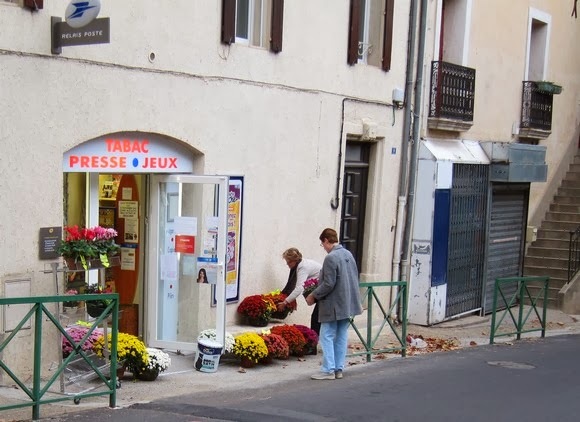 They also diversify somewhat; the Aspiran Tabac sells newspapers, magazines, lottery tickets, scratch cards, confectionery, greetings cards, postcards, drinks, wine, gifts, various domestic replacements and even flowers. 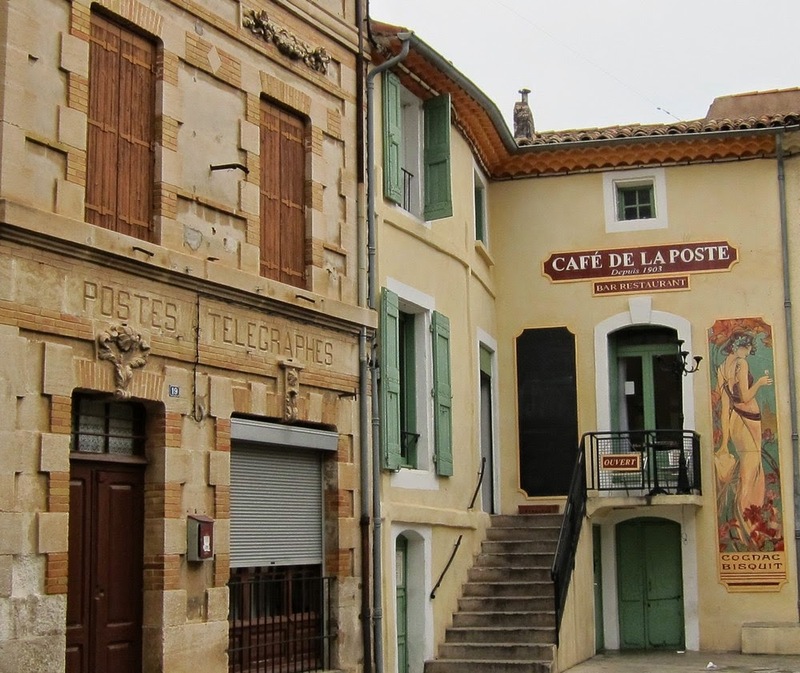 Since the closure of the village "La Poste" the Tabac has provided postal services boosted by significantly longer opening hours. Even photocopying services are offered. A new couple have taken over and injected some energy into the operation. They converted their ground floor cave next door into a swish cosy new Tabac that opened in the autumn 2013. The previous Tabac (on the right in the photo) was rented so the relocation has saved ongoing costs. Chrysanthemums for sale. Most will have been placed in the cemetery for Toussaint (1st November). 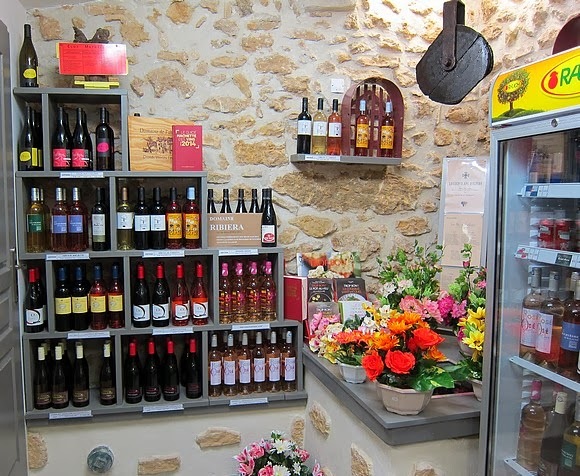 A handsome selection of local wines are stocked, including selections from four of the communes' independent domains. 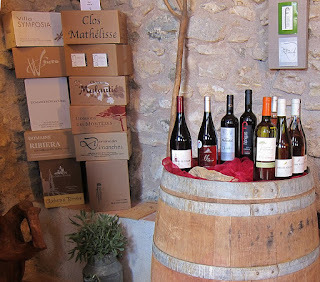 Aspiran is a wine village with a population of around 1250 on the western edge of the Hérault valley between Clermont l'Hérault and Pézenas. There has been a settlement here since at least Roman times - archaeologists are excavating the site of France's oldest known winery dating from the 10th year AC. Today Aspiran sits in a sea of vines along with olive, pine and oak trees.